In Afghanistan with the Third Brigade of the 10th Mountain Division, the photojournalist Erin Trieb faced firefights, anxieties about land mines and the strangeness of being the only woman among hundreds of alpha males. Then came the hard part. 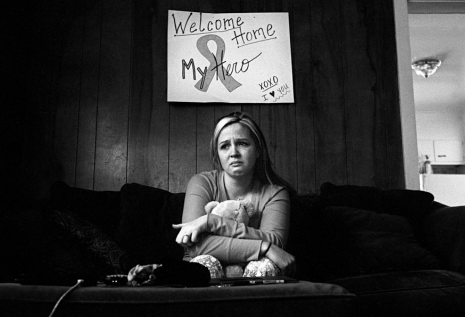 Ms. Trieb, 28, said she found it far more daunting to photograph the effects of post-traumatic stress disorder among the same soldiers when they returned to Fort Drum in upstate New York in December 2009. “Almost every soldier I talked to said they were having problems,” she said. These included drug abuse, binge drinking, attempted suicide and spousal abuse. She would like to do something about it. On Tuesday, Ms. Trieb plans to open the Homecoming Project, a Web site intended to encourage discussion about the aftermath of the wars in Afghanistan and Iraq, to connect soldiers and their families with the assistance they need and to offer opportunities for service to organizations and individuals.